The concept of fear is an incredibly interesting one. Fear is a debilitating feeling. It is one of those few things in the world that can stop you from doing something you want to do. Fear happens to everyone no matter how old, young, big, small, or in between they are. As a professional in the finance industry, it’s interesting to see how fear molds household financial strategies, stops people from taking that vacation, or even earning free things. Today, I’m going to talk about one of the biggest product fears in the financial realm, fear of rewards credit cards; and how to combat it! I can’t tell you how many times I’ve talked to someone that wanted to earn rewards and found the concept of taking a free flight compelling; yet didn’t use them because they were afraid it would lead to debt. See the general idea most consumers have of rewards credit cards is that they’re a trap. Credit card companies entice you into using their cards by offering rewards. Before you know it, you’ve spent far more than you can afford to pay back. If you really think about this process, it’s not credit cards that people seem to be afraid of. Instead, they’re displaying fear that they will not be responsible with the credit that’s extended to them. Isn’t This Fear Somewhat Necessary? Absolutely. If no one had any reason to fear credit card debt, everyone in the world would be overwhelmed by it. It is good to have a certain level of fear that dictates what you do financially. However, as with anything else, fear is only good in moderation. If you’re not too scared to use the credit card, but fear holds you back from spending more than you can afford to pay back, that’s a healthy dose of fear. However, if you’re completely afraid to take advantage of financial tools because you’re not sure how you’ll react to them, the fear becomes unhealthy! 1. Trust Yourself – The credit card is not going to put you into debt, but using the card improperly will. You already know this. So, by knowing that you’re in control, you also know that the only person that can put you into debt is you. Is there any reason to do this to yourself? NO! You’re responsible, you’re smart, and you’ve got the drive to stay out of debt! 2. Get To Know Credit Cards – Believe it or not, overwhelming opinion about most things surrounding credit cards is simply ignorant. It really bugs me to see that so many people are so undereducated with regard to great financial tools. Don’t be one of those people. When you’re done with this article read more. Look up everything you can think of with regard to credit cards and do your research. As you get to know the inner workings of these tools, you’ll most likely become more comfortable with using them. 3. Create A Plan – Anything works better with planning. So when it comes to using rewards credit cards, create a plan. Figure out how much money you can comfortably spend on your credit card every month while being able to pay it off completely by the grace period. This way, you earn maximum rewards and pay no interest. Once you have a plan, you’ll be more comfortable with your ability to stay out of debt. It’s unfortunate that fear stops so many people from doing so many good things for themselves. However, you don’t have to be one of those people. Just remember, credit cards aren’t EVIL! Instead, they’re great financial tools. However it is important to remember that there are negative repercussions associated with using credit cards improperly. Nonetheless, that doesn’t make it any more dangerous than a lawn mower. After all, if you run over your foot with a lawn mower, you lose your foot! 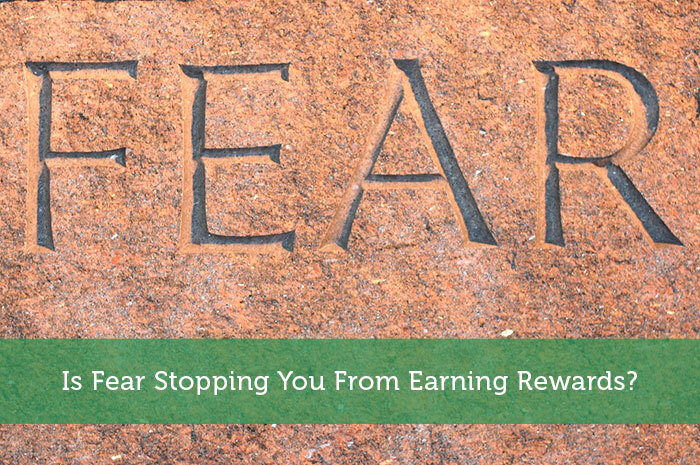 Is Fear Stopping You From Earning Rewards? I agree with what you said about how credit cards aren’t evil. There are so many people out there that are so against the idea of any usage of credit when it’s all about being responsible with your money! People are naturally afraid of what they don’t know, money and credit being a huge one! I have to disagree. Credit cards are evil. At least the banks issuing them are. I can’t fathom how they get away with charging 20% to 30% when their cost of funds is like 0.5% (what is the Fed Funds rate these days, is it still that low? I’m being lazy and not checking). How they get away with that is that we let them. Can we all say a collective Baaaaa! The temptation to misuse the cards is much costlier than any savings you would gain by collecting rewards. I love using my credit cards for rewards! As long as I pay them off every single month and never carry a balance I might as well use them to get some cashback. I can see how some people might fear using it because they might go into debt. As long as you learn to use it correctly you’ll be fine though. Financial services often scare a lot of people. Hopefully people will soon adopt Bitcoin and then we can stop paying credit card fees etc all together! I consort with your thought. You should not be afraid of utilizing a credit card. As long as you know your boundaries, then applying a credit card is not to be afraid of!